Finally, the show we have been talking about for months and months has debuted. Technical problems, show changes and overall concerns about its lack of entertainment value have delayed the shows start from April 22, 2016 all the way to February 17, 2017. But here we are and it happened. I wanted to give you my 2 cents on the show as I saw it twice over opening weekend. The early show and then the next night, the later show. First, some of the bad. Crowd control needs some adjustments. The line for standby can wrap all the way from the Nemo stage to Flame Tree BBQ, and cause all sorts of bottle necking. 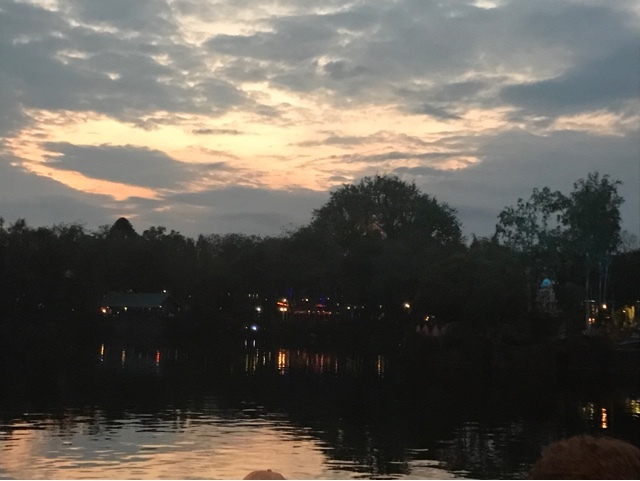 To make matters worse, if there are two shows and you are seeing the first, they send you all the way around the lagoon into the heart of this huge standby line creating a minor disaster. When I attended the second show, the first one had technical problems which meant it was still going when you were suppose to be entering the theater for the late production, again creating crowd problems. I don't like the fact that they don't sell anything to eat or drink in the theater itself. You have to leave and come back, not exactly convenient. But if you have a fast pass, you won't need to be in the theater long, the show is less than 15 minutes. Which is a good thing as the earlier version of the show dragged out a bit too much. Now the show is crisp and clean preventing any lag. And there are many good things about the show: The music is downright terrific and will soon be on sale. 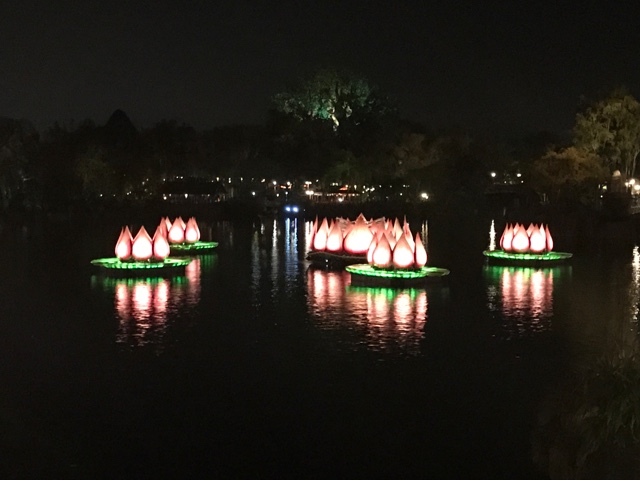 The lotus flowers turned fountains are beautiful and impressive. 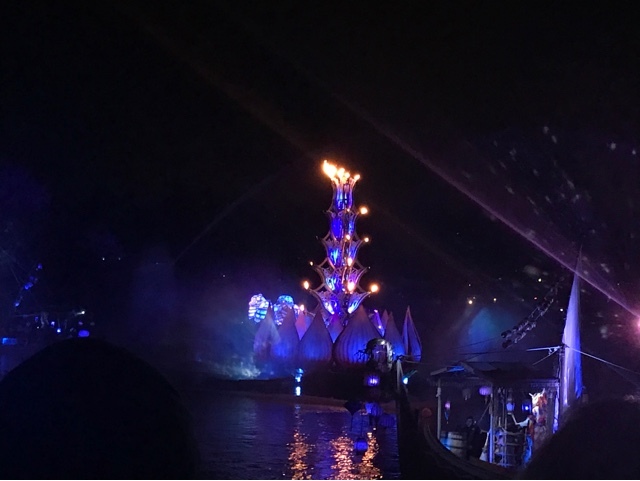 The visuals on the water screens are infinitely better than the water screen images from the Jungle Book show from last year. The floats are also pretty. On the negative side, the narration is relatively pointless as are the shamans although the boats they are in are quite nice as aesthetic. So is the show worth the wait? Yes you definitely should see it but don't expect to floored. Rumor has it that despite attempts to increase the "wow" factor, Disney decided to launch the show now, as they needed it to be fully operational well in advance of the Avatar opening in May. 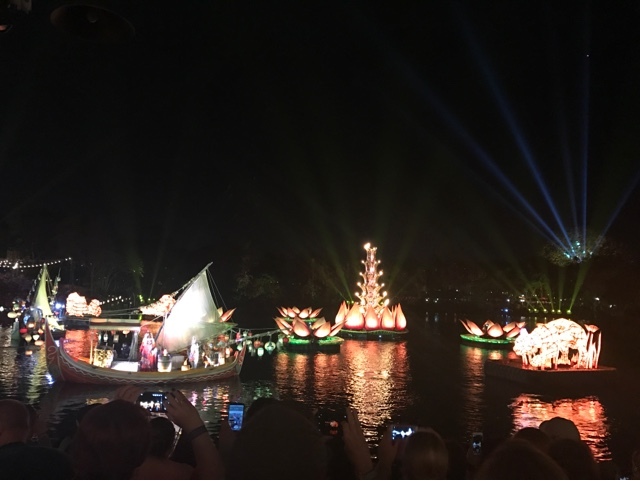 There is no doubt that the show is beautiful and entertaining, but it does lack that "wow" factor, usually brought about by fireworks which, of course, cannot be used with the live animals nearby. It will not leave you stunned like seeing Illuminations (which for my money is still the best night time show). But there is little doubt you will enjoy it. 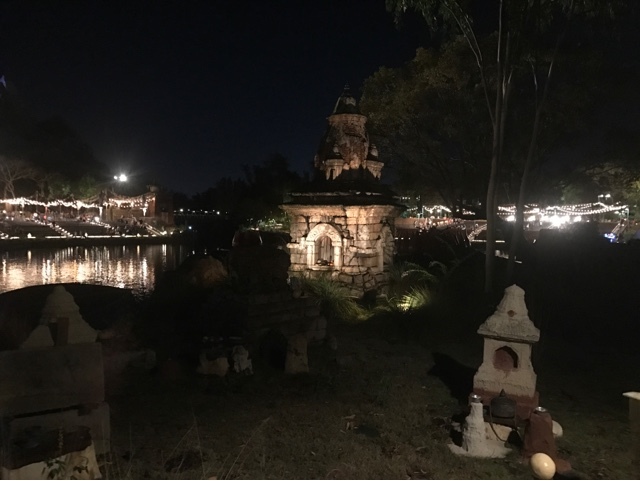 While Illuminations or Wishes are more like the roller coasters of night capping events with thrills and chills, Rivers of Light is like a beautiful, soothing boat ride. And who the heck doesn't love a good boat ride.